Daniel336 1 year, 5 months ago. Android Oreo 8.0 ROM, LineageOS 15 for LG K8 has now arrived via a development build. 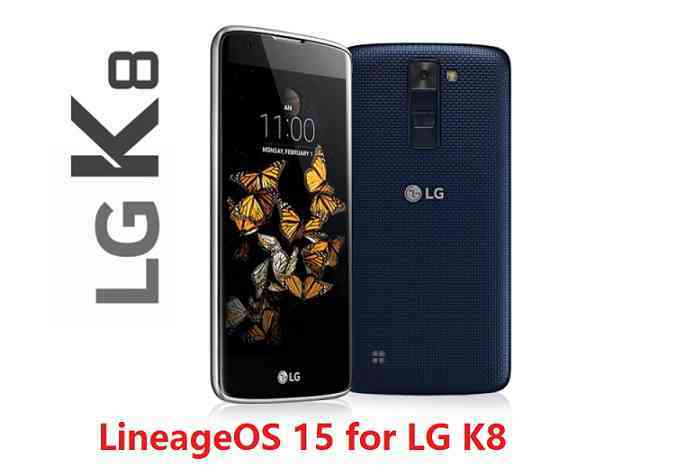 This post provides the download link to LineageOS 15 ROM for LG K8 and guides through the installation process of the same. If you want the OFFICIAL Lineage OS 15 update or some more Android Oreo ROMs then stay tuned to the Android Oreo Lineage ROMs page or the AOSP Android Oreo ROMs devices list page. This Lineage OS 15 Oreo ROM for LG K8 is brought to you by developer RomClaims. No donation link found for RomClaims. THIS IS AN INITIAL BUILD WHICH MAY NOT BOOT AT ALL. HAVE A BACKUP BEFORE FLASHING THIS AND TRY AT YOUR OWN RISK. Installing a custom ROM on a LG K8 requires an unlocked bootloader on LG K8 Mediatek, which may VOID your warranty and may delete all your data. Before proceeding further you may consider backup all data on the phone. You are the only person doing changes to your phone and I cannot be held responsible for the mistakes done by you. – Here is theTWRP update guide for the LG K8. This TWRP recovery guide requires an unlocked bootloader on the LG K8 Mediatek. Download and Copy the GApps and the LineageOS 15 for LG K8 Oreo ROM ZIP to your phone. First flash the Lineage OS 15 for LG K8 Oreo ROM ZIP from device. Then flash the GApps zip from your device memory. Reboot and Enjoy Android Oreo with LineageOS 15 ROM on LG K8. Copy the latest LG K8 Lineage 15 ROM ZIP file to your phone. Stay tuned or Subscribe to the LG K8 forum For other Android Oreo, Nougat ROMs, LineageOS 15 ROMs, other custom ROMs and all other device specific topics. I have a 255 update error when installing the rom with twrp3, what can it be? it has me crazy. My model of the 2016 lg k8 version k350n. also can not use fastboot flash recovery twrp.img only fastboot boot twrp.img and so install twrp in the phone. hello, get install it and now it does not boot, nor load, nor can it in download mode, I try to make a testpoint to repair it but I do not find information about it, I opened the zip of the lineage and the boot.img weighs 8 megs while mine weighs 16 megs I think that’s the reason why it was made a hard brick, does not have some solution, because I broke the system. The room threw the 255 error when installing it which causes the phone to move to fix it, go to the official page to download and write the original password and inscribe it with the copy. I would thank the administrators for the room where the users’ room is located. I installed the rom with Flashify (for root users) because with twrp I gave 255 error, now I do not boot the phone or dowload mode, nor hard reset when I insert the cable to the pc the drives the deteccata but the phone disconnects only the drivers I’ve done it and tried to do test point but without exrom kdz but I mentioned before it starts, thanks and if you can help me it would be the best. Yo instale el rom con Flashify (for root users) por que con twrp daba error 255, ahora no me arranca el movil ni modo dowload, ni hard reset al insertar el cable al pc los drives los detecata pero el telefono se desconecta solo los drivers lo he habierto y he intentado hacer test point pero sin exrom kdz pero lo mencionado antes que ro arranca, gracias y si pueden ayudarme seria lo mejor. Lo que yo hice para repara mi lg fue instalar los drivers mas recientes del teléfono, luego me descargue el lg up y lo inicie conectando al mismo tiempo el teléfono, seleccione la room original anteriormente descargada y la reinstale aquí el link del vídeo que utilice https://www.youtube.com/watch?v=x63BKwaIUfA&t=709s espero te sirva y puedas arreglar tu movil. What I did to repair my lg was to install the most recent drivers of the phone, then I downloaded the lg up and started connecting the phone at the same time, select the original room previously downloaded and reinstall here the video link using https : //www.youtube.com/watch? v = x63BKwaIUfA & t = 709s I hope you serve and can fix your phone.